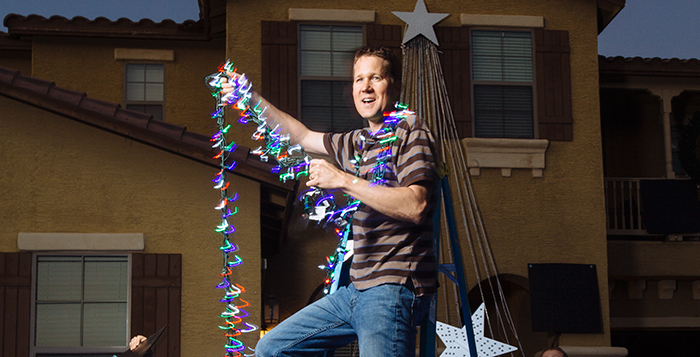 Dayv Morgan, a top contender in Maricopa’s 13th annual Holiday Homes and Businesses on Parade, will flip the switch on this year’s display at his lighting party on Dec. 9 at 6 p.m. This is Morgan’s third year in the competition. He won Best Overall in 2014 and took Best Light Show last year. Even outside the competition, his home has become a go-to site for residents looking for Christmas lights. “The key is picking good songs,” Morgan said. This year, there are three songs in the line-up. Galloping Jingle Bells will be one of them. A video of the light show will be posted to Morgan’s business Facebook page (Dayv Morgan of Homesmart Real Estate). For every new “like” his page gets, he said he will donate $1 to F.O.R. Maricopa, up to his goal of $5,000. “They can always use more donations, more help and more food,” Morgan said. Morgan said last year’s Facebook video had more than 10 million views. Despite the popularity of his display, Morgan said traffic has not created a problem on his street in Palo Brea. In 2014, the Morgan light show won the top prize. His first year in the competition, Morgan used Let It Go from the movie “Frozen” for his display. Inez Ramirez lives across the street from Morgan. She and her two children, ages 15 and 20, enjoy the display each year. The City of Maricopa is hosting the 13th annual Holiday Homes & Businesses on Parade Dec. 9-18. Deadline to enter was Dec. 1. There will be judging by a city committee, which will visit all participants Dec. 13-14. Their results will be announced Dec. 20. Niesha Whitman, the city’s events manager, said homes will be judged in four categories: Best theme, best light show, best use of color and Best on Parade, which has a $300 cash prize. Best Business will receive a fee waiver on a banner permit for six months. Community members also have a voice in the proceedings. The winner of the Resident’s Choice award wins $300 as well. “If a house wins Best on Parade three times, they get put in the Hall of Fame and won’t compete again,” Whitman said. For a full list, go to http://bit.ly/2eOapPv. Last year’s set-up took about 200 man-hours, not including the music programming, which he has begun to outsource. Morgan said each minute of music takes about 10 hours to program. Morgan said because he left some of the smaller displays together in storage units, he is hoping he can cut his set-up time in half. He rents two units to house his decorations, spending $2,000 a year just on storage. “It’s definitely not an inexpensive project,” Morgan said. 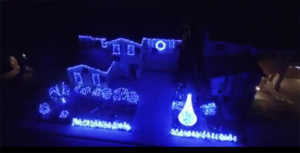 However, Morgan said the cost of electricity is minimal, increasing his bill by only $100 to $200 for the month the display is lit. Morgan bought 100,000 LED lights when he began his display two years ago. “This is a great opportunity for everyone in the community to come together,” Ramirez said. Morgan’s home is at 43954 W. Palo Abeto Drive. The display will be lit from 6 p.m. until 10 p.m. every day until the New Year. Tune into 96.3 for the show’s music.